Massey fashion design student Pania Tuker won the Emerging Designer award and the A.G. Park award for innovation at Miromoda. Pania will show her work at New Zealand Fashion Week’s Miromoda Showcase. Future fashion designers need to be ahead of the game, innovative and flexible. In the fashion design major, you will learn about pattern making, construction, materials, and undertake historical and contemporary fashion analysis and critical thinking. You will challenge how things are done through fashion design practice. You will learn to work with clients and fashion related industries and devise your own unique fashion collections. To get into the fashion major, take 212.157 Dress in first year. View the Dress video here. First year students get two slots for “elective” courses, and there are two fashion electives: 212.100 Fashion Pattern Making and 212.101 Fashion Construction. These are not compulsory. If you’re interested in digital fabrication, you might consider 197.122 Digital Fabrication. If you want to work on your sketching, you might consider 213.155 Drawing the Body I. You might even want to build up a Minor in a business (eg marketing or communication), health or expressive arts field. Some graduates develop their own labels, while others work in design, production, marketing, merchandising, and a wide range of other activities. You can use the degree as entry to fashion design and brand development in diverse areas, including high fashion, sports, corporate and other specialised clothing, buying and selling, display, costume for stage and film, production planning, quality assurance, materials sourcing, and specification development roles. You may also continue to postgraduate study and further develop your design abilities, knowledge, research interests, and skills. See more of what Yoshino has been up to at www.yoshinomaruyama.com. See more of what Jacob is up to at jacobcoutie.wixsite.com/kuti. 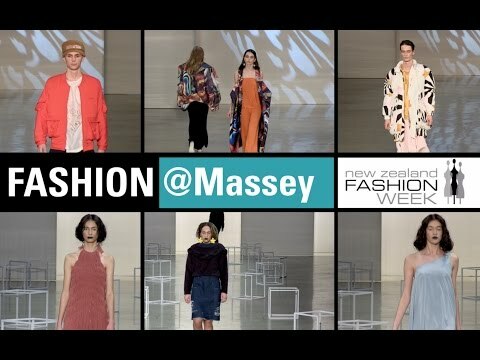 FASHION@Massey! Four recent Fashion design graduates and two current Fashion design students show their collections at New Zealand Fashion Week 2016. Join Holly Dodson as she takes you backstage amongst the glitz, the glamour and the pre-show nerves. If you are attracted to the business end of fashion, then New Zealand’s only joint major in fashion design and business is perfect for you. You can connect your fashion design thinking and making to business and communications expertise, to develop a unique blend of skills for a progressive global market. Alongside all the core fashion courses, you’ll take a suite of courses from one of the business majors on offer: marketing, entrepreneurship and small business, or communication.